Maldives Attorney General Mohamed Anil speaks during a press conference in Male, Maldives, Wednesday, Nov. 4, 2015. The Maldives declared a state of emergency Wednesday due to a "threat to national security," the Indian Ocean island nation's foreign ministry said. In a post on its official Twitter account, the ministry said the measure would be in place for 30 days. The country's constitution allows the president to extend a state of emergency with the approval of the legislature. It also says the government can temporarily suspend certain constitutional rights during the emergency, but may not restrict freedoms such as the rights of free expression, free press, and fair and transparent hearings. The move comes a day after President Abdulla Yameen gave a speech declaring the government would "take all necessary steps to ensure the safety and security of the people," according to a statement from his office. The president said there are those inside and outside the country who want to destroy its peace and harmony, and called on citizens to "be aware of traitorous plotters." Monday an explosive device was found and safely defused near the president's official residence. The remotely controlled improvised explosive device was planted on a vehicle parked by the palace. No one has claimed responsibility for planting the bomb. Last month, authorities arrested Vice President Ahmed Adeeb on suspicions he was linked to a September explosion on the president's speed boat that officials have said was an assassination attempt. President Yameen was not hurt, but the blast injured his wife and two other people. 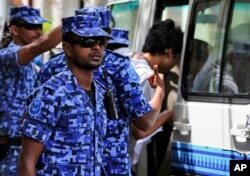 Monday Sri Lanka arrested a Maldivian teenager wanted in connection with the explosion and turned him over to Maldives officials. FILE - Maldivian police force on guard after the arrest of Vice President Ahmed Adeeb in Male, Maldives, Oct. 24, 2015. Earlier this year, a three-judge panel convicted former President Mohammad Nasheed and sentenced him to 13 years in prison for ordering the arrest of a chief judge in 2012. The United Nations human rights office called the proceedings against Nasheed extremely unfair, and a U.N. official said the trial appeared to have been politically motivated. The situation in the Maldives has drawn additional international scrutiny with U.S. Senator Patrick Leahy teaming with 13 colleagues to introduce a bill Tuesday calling for the release of Nasheed and all other political prisoners. The bill says increasing human rights violations in the country are fueling instability and posing a threat to regional security. "The United States and the Maldives have common interests in maritime security, commerce, and addressing climate change," Leahy said in a statement. "But we also expect our partners to respect the fundamental rights of their people, including those who disagree with the government's policies, and to uphold the basic principles of justice."